The production of anthologies featuring poetry remains one of the crucial yet under-examined features of 1960s and 1970s black print culture. Thirty years ago, anthologies were indispensable mediums for transporting assortments of individual poems and hence poets to thousands and thousands of readers. Between 1965 and 1976, dozens of collections appeared that contained black verse; those anthologies established places in American and African American literary history for select poems and poets. 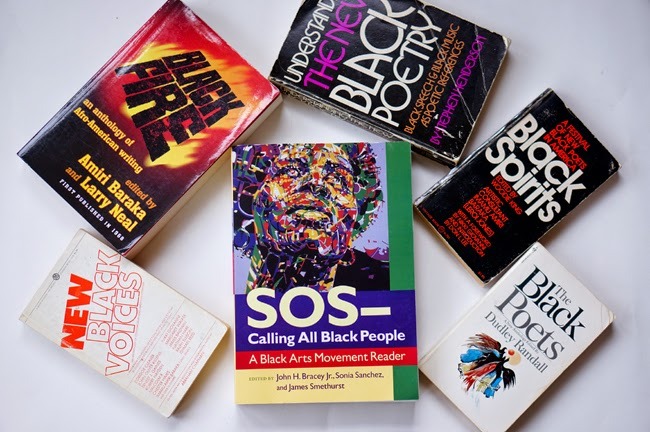 SOS--Calling All Black People: A Black Arts Movement Reader (2014), edited by John H. Bracey Jr., Sonia Sanchez, and James Smethurst, contributes to and at the same time gives new shape to the presentation and preservation of black arts poetry. Most notably, the sub-sections in the poetry section differs from most anthologies and allows readers to consider key tropes or motifs in black arts poetry. We are also inclined to reconsider definitions of poets and poetry. The sub-sections for the poetry section include: Consciousness, Malcolm, Coltrane and Jazz, Africa, Women, Heritage, and Songs. The editors' approach to arranging the poems prompts us to consider the unified diversity of poetic compositions by a wide range of writers. Often, black poets are grouped together because of their apparent shared race, but in this Black Arts Reader, the groupings relate to how poets covered common topics and themes and in the process, how poets and editors shaped black arts discourse. The editors could have chosen to present poets and their works in order based on their last names or birth years. However, arranging a selection of Malcolm poems, a selection of poems about Africa, and a selection of poems that celebrate women, for example, we gain an appreciation for part of what made the Black Arts Movement a movement. The poetry included in SOS offers a glimpse into the interrelated artistic projects and subjects that poets addressed. The final sub-section, "Songs," includes lyrics by James Brown, Oscar Brown Jr., Marvin Gaye, Curtis Mayfield, Wledon J. Irvine Jr., Norman Whitefield, and Norman Barrett Strong. These days, people spend an extensive amount of time debating whether rap is poetry. SOS, however, urges us to look back to the 1960s and 1970s and consider the relationships between poems and song lyrics. What if James Brown was a poet; or conversely, what if Amiri Baraka was in fact a soul singer? Over the years, I've enjoyed thinking about the functions and implications of anthologies. This new black arts collection extends my interest.